Port Douglas Luxury Holiday Home - Villa - Heated Pool during winter. Situated in the most prestigious part of town, Flagstaff Hill, this free-standing luxury holiday home is a must see for those who enjoy the relaxed ambiance of an Eastern paradise. With serene water features, private plunge pool, lush greenery and a beautiful use of lighting, this open plan house incorporates outdoor and indoor features in a unique and beautifully stylish fashion. Fully air-conditioned, with ceiling fans and a heated private pool, it sits within walking distance of restaurants, bars, boutiques and cafes and is only two hundred meters from the famous 4 Mile Beach. 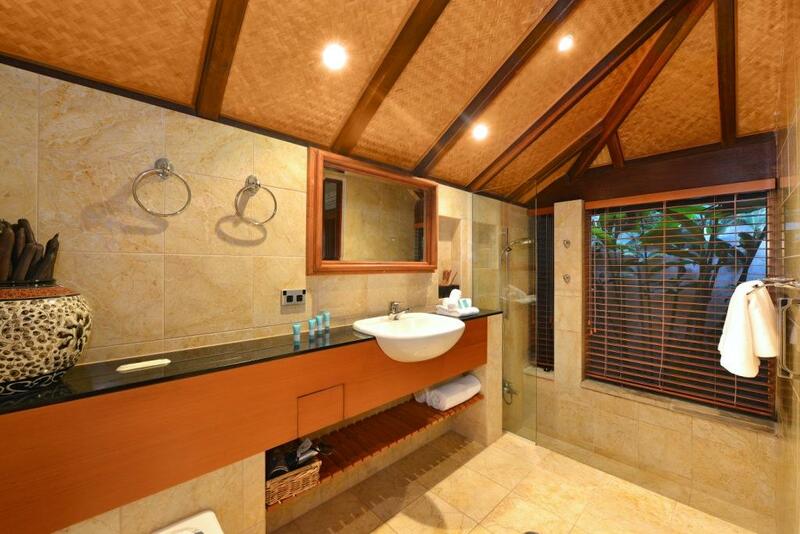 Call 1300 780 806 to book your next holiday in this stunning Port Douglas Luxury Holiday Villa. FREE Night Deal - Stay 6 Pay 5 or Stay 12 Nights and only pay for 10! See our Accommodation Specials to BOOK NOW! Experience a luxurious tropical holiday with your own private plunge pool, fully self contained home with kitchen facilities, and bifold doors allowing the outside in - luxurious tropical living. The master bedroom includes a king bed, the second a queen and there are two bathrooms. This gorgeous luxury holiday home is set in an oasis of tall trees and tropical gardens, but its best feature is the open design that brings indoor and outdoor areas together. The serenity of this gem of a house is perfect for honeymooners or couples who wish for privacy and seclusion in an unbelievably beautiful setting of peace and tranquillity. A non-smoking home, it offers free off-street parking, a fully equipped kitchen with dishwasher, BBQ, CD/DVD and clock/radio and laundry. Please note there are several stairs prior to entry of this villa. If you are planning a Port Douglas wedding please contact our groups department and they may accommodate all of your guests in nearby private holiday homes, holiday villas and private let holiday aprtments. We can also arrange all of your pre-post touring to the Great Barrier Reef and Daintree Rainforest for your wedding guests. Port Douglas is located in one of the most gorgeous areas in the world, with the jewel in the crown being The Great Barrier Reef. Surrounded by statuesque mountain ranges and two world-renowned national parks, this tropical paradise is the ideal setting for such a beautiful house. Please note: You will need to walk down some stairs to reach the villa.